Mood: Super happy to meet someone who isn't REALLY famous. Soundtrack: The Decemberists "The King is Dead" "Long Live the King" and "What a Terrible World, What a Beautiful World"
I started following Lindsay Jones on Twitter back when she was a Broncos beat writer for the Denver Post. (She is now an NFL writer for USA Today) When I started with Instagram, they checked my Twitter feed and saw I was following her, so they recommended I follower her on Instagram. She has an okay Twitter feed, but an outstanding Instagram feed, so I really got a feel for who she was based on the pictures she would post. She loves dogs (and has several), she has an adorable toddler daughter, and she loves running. She posts photos from runs of places that I frequent, and I always thought that someday I'd probably bump into her. 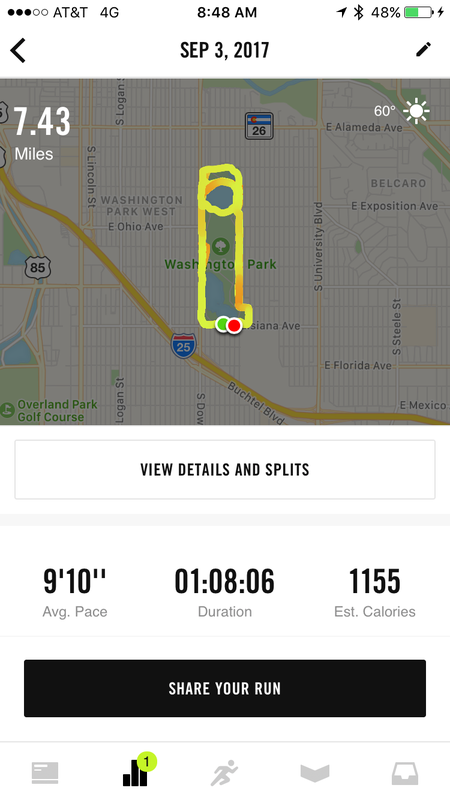 I was in the middle of my second lap at Wash Park on Sunday and I saw a woman pushing a jogging stroller who looked remarkably like her running in the opposite direction I was. I kept running, but when I saw her half a lap later on the other side of the park, I had to see if it was actually her. "I know this is weird, but are you Lindsay Jones?" "Yes???" she said hesitantly before looking at me. Followed by a very friendly, "I know you from Instagram!" We said hello for a few minutes and so as not to be overly creepy, I said it was nice meeting you, and then peeled off in the other direction. It wasn't really a big deal. It's not like she's super famous or has an ultra glamorous job, but I was more excited to meet her than I would have been to meet 98% of the Denver Broncos players because I have followed her for years on Instagram and gotten a sense of who she is. She was my internet celebrity, and I got to meet her. It was all very exciting in a very ridiculous way, but it made my Sunday morning. I was especially glad to find that she seems to be just as nice as she projects on her social media. Yay for Lindsay.